Protecting your people, product, and physical plant from collisions is one of the best investments you can make. In 1986, we set out to design the toughest guard rail system in the industry. After more than 40,000 installations, no other brand exceeds the rugged design of Steel Guard®. Now that’s one tough rail! Choose the height of your system. Steel Guard® is available in either single or double high. Choose Post Type. Standard corner posts are available. Center posts are available in four options: standard, standard offset, end offset and side offset. Choose your rail lengths. Note that rails are measured from post-to-post, on center; actual rail component will be 4″ shorter than the specified length on Steel Guard. Lift-out pockets increase center-to-center dimension by 1″. Choose bolted or lift-out rail. The lift-out rail provides equipment protection while still enabling easy access when needed. Choose your configuration. Options include straight, optional side angled, and vertically angled. 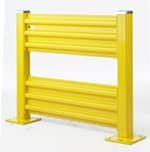 We will be happy to recommend the industrial guard rail or other safety solution right for your environment. Steel King also carries a full line of industrial racking safety accessories including Safety Gates, which can be ordered as part of a new installation or retrofitted into an existing system. They’re self-closing and include a hinge assembly on one side of the gate and two gate stops on the opposite side, for hanging in either direction. Many standard Steel Guard® products are available through our 48 Hour Quick Ship program. Each unit includes 3/4″ x 5-1/2″ anchors. Anchors are shipped in a box within the guard rail column.